Replacement B 2nd string for an EJ16 (light tension) string set. PL016 is a .016" (0.406mm) gauge plain steel string for acoustic or electric guitar. Perfect as a replacement string or for creating customized sets. 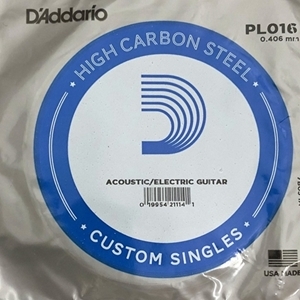 D'Addario plain steel guitar strings are acclaimed worldwide for their superb, long-lasting tone. They are equally suitable for both electric and acoustic guitar.